With your business application deployed to a correctly-configured AMI instance, the next step is to establish monitoring of the platform with JBoss Operations Network (JON). The JON server is commonly located inside a corporate network, so it's necessary to establish a secure connection between the server and each of its agents. Establishing a VPN between the two points is the most common solution but this complicates the required networking configuration. 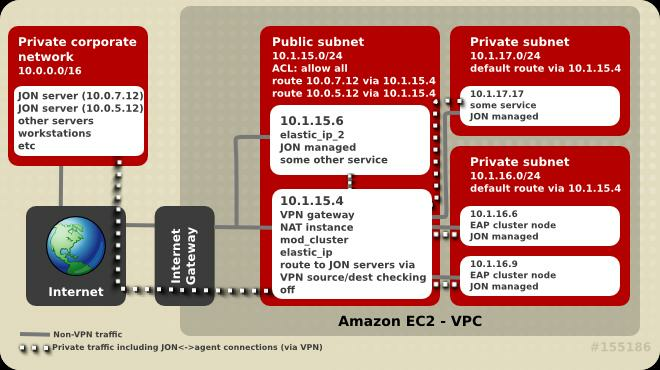 This chapter provides network configuration guidelines for enabling communication between the JON agent and JON server. For more extensive information on configuration, management, and usage please refer to the official Red Hat documentation for JBoss Operations Network (JON).